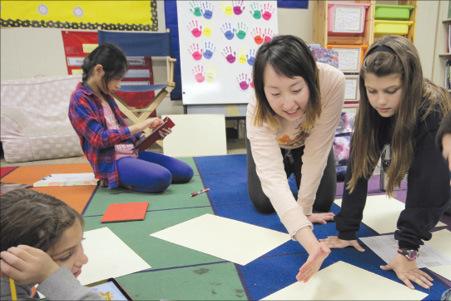 Bullis Charter School associate teacher Elle Pan gives feedback on the shark-shaped plane a student drew in class. The school’s Associate Teacher Program prepares teachers to meet the demands of the 21st-century classroom. Bullis Charter School doesn’t just hire new teachers – through its Associate Teacher Program, administrators ensure that every new instructor is properly prepared and the perfect fit. “The Associate Teacher Program is a certified position, with the primary objective of helping reduce the teacher-student ratio in order to execute the personalized learning program we have at Bullis,” Superintendent Wanny Hersey said. But lowering the teacher-student ratio is just one of the benefits of the program, according to Hersey. Researching the idea of a teacher-residency program, officials from the Bank Street College of Education’s Sustainable Funding Project recently visited Bullis Charter School to witness the Associate Teacher Program in action. The Sustainable Funding Project was created to address ways to guarantee that all aspiring teachers matriculate through affordable, high-quality programs that enable them to enter the profession prepared for the demands of 21st-century classrooms. “Our goal is to spread the intention to have teacher preparation include a yearlong co-teaching residency placement and for that to become the norm,” DeMoss said. After Hersey contacted DeMoss to discuss the charter school’s Associate Teacher Program, DeMoss and colleague Brigid Fallon visited the school. During their two-day visit, DeMoss and Fallon observed Bullis Charter School’s program for all new instructors – whether they are just out of their certification program, returning to teaching after a few years off or new to the school. There is one associate teacher for every three homeroom classrooms, enabling the associates to work with three mentor teachers and exposing them to different grade levels and subjects. Hersey explained that the associate teachers have multiple chances to improve. They might teach a science lesson in one classroom, receive feedback from the teacher of that class and then have the opportunity to refine that same lesson for one of their other classes. Another benefit is that associate teachers can easily substitute in classrooms when a teacher is absent. Hersey said the school currently has three teachers out on leave, and having the associate teachers serve as long-term subs creates a seamless transition with no lost learning time. Nate Rinaker, who teaches second grade at the school, said when he was an associate teacher, he got to know two grade levels and worked with teachers with different teaching styles. Students also appreciate the associate teachers, according to Rinaker. “Most of the associate teachers work across more than one grade level, and as the kids go up in the grade they will likely see that familiar face again,” he said. Rinaker added that the program boosts confidence, and the “more gradual” step to becoming a teacher will most likely prolong the associate teachers’ careers. For more information on the Sustainable Funding Project, visit bankstreet.edu/innovation-policy-research. For more information on Bullis Charter School, visit bullischarterschool.com.